Last May, the folks down in the West Bottoms decided to throw a car show. The expectations weren’t all that great; maybe they’d get 20 or 30 cars. But it turned out to be one of the biggest car gatherings of the year. So when organizers decided to hold another one last Saturday, they thought it would be a sure-fire hit. They must have handed out 100,000 flyers. They had vendors and contests lined up. There’s no way it could have missed. Let me just put this out there. If I had 50-large to spend on a new vehicle right now, I’d be mighty tempted to order a new 2014 GMC Sierra 1500 SLT 4X4 exactly like the one I just finished test driving. Bright red? Absolutely. 20-inch chrome wheels? You bet. Z71 off-road suspension? Sign me up. Honestly, if you’re into cars, and appreciate a modern interpretation of the classic American pickup, there’s not much to dislike here. Allow me to explain. If you were looking for old cars in the Kansas City area last weekend, you were going to find most of them in Ottawa. But it also happened to be the final Outta’ Control Hot Rods Pizza Shoppe Cruise of the year in Platte City, and I really wanted to check that out too. Surprisingly, it wasn’t a complete bust, as the owners of several nice cars and trucks decided to stay closer to home and have some pizza instead of braving the sea of chrome and billet down south. This is another one of those end-of-the-season weekends where there’s so much car stuff going on around Kansas City, it’s hard to decide what to do. The West Bottoms Car Show should be a good event if the last one is any indication. The Basehor-Linwood High School show should be a good one if the past 15 years are any indication. If you like Chevelles, you’ll definitely want to be at I-435 and Midland. And that Cars in the Park event in Shawnee usually brings ‘em in too. To help you decide what to do, here is the Kansas City car show, car cruise, and car racing calendar for September 25, 26, 27, 28, 29, 2013. As we have proven here time and again, there are tons of car shows and cruises in the Kansas City area. We look at quite a few of them here, and have the chance to check out cars all over town. You tend to see different cars in North Kansas City than you do in, say, Gardner. But regardless of which part of town they are from, it seems like all of them headed straight for Ottawa, Kan., over the weekend for the 27th-Annual Old Marais River Run. This is, without a doubt, the biggest show in this area. With nearly 2,000 pre-1972 cars and trucks, this is the who’s who of the Kansas City, Topeka, and Wichita car scene. For years, the Gladfest Car Show was one of the crown jewels of the Northland. But they eventually outgrew their location, and last year the event dropped from the schedule. Don’t get too upset though, because it was back again this year and better than ever. They moved it to the Antioch Worship Center, and despite the name, it is on a different weekend than Gladfest now. If you were there, you know that moderate temperatures, copious sunshine, and plenty of space made for a top-notch event in Happy Rock. It’s hard to believe, but the car show season will be going dark soon in Kansas City. Of course, that means that some of the biggest events of the year are scheduled before the lights go out. For example, the Ol’ Marais River Run it this weekend in Ottawa, and they don’t get much bigger than that. The Boy Scouts have handed me somewhere around 247 fliers for their upcoming car show in Lee’s Summit this Saturday. Of course, you’ve got your Platte City Cruise, your North Kansas City Cruise, and the Jesse James Festival Car Show in Kearney. You may also note that the racing portion of the calendar is getting shorter, which means you better get some short track action in while you can. 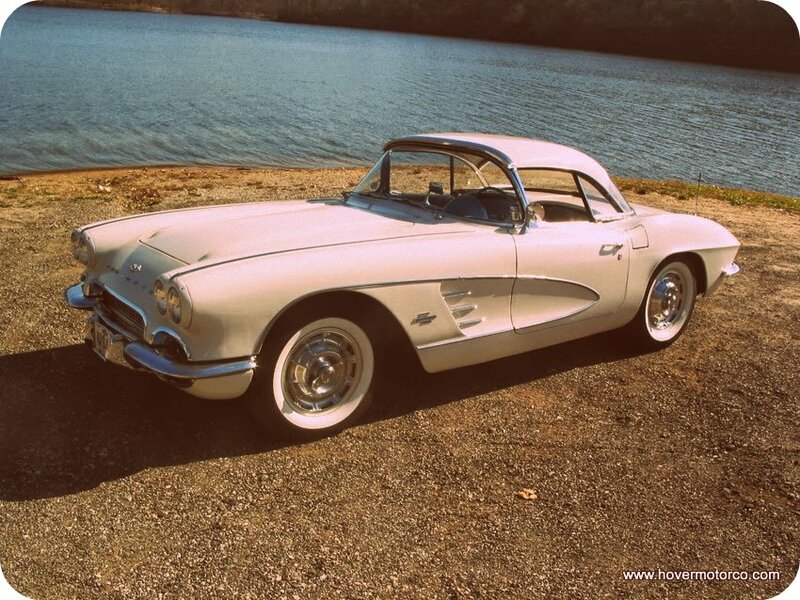 Incidentally, I'm planning to be in Ottawa on Saturday with my dad in his 1961 Corvette. Stop by and say hi, and if you want to buy a Hover Motor Co. T-Shirt, I should have a few of those available too. See the entire Kansas City car show, car cruise, and car racing schedule for September 18, 19 20, 21, 22 in the calendar below. Car shows can suffer from all kinds of problems—heat, rain, location. But every once in awhile, everything comes together exactly like it should, and what you’re left with is a huge turnout of nice cars. That’s what happened on Saturday for the annual Turkey Creek Car Show in Merriam, Kan. This was a massive event, complete with sponsors, a mini swap meet, and hundreds of shiny rides sparkling beneath the comfortable Johnson County sunshine. Conditions don’t get much better. As summer comes to an end, we start getting more “must attend” car events to wind up the season. One of those is the KCI Airport Cruise, which took place last Saturday night at the Ambassador Building near the airport. As usual, there were tons of cars and tons of great door prizes. Add the beautiful weather, and you’ve got the recipe for a huge event. The Hovers did their part, as my dad brought out his old Corvette and parked it right next to my truck in the crowded parking lot. Here’s one you might not have known about. Adesa has a huge auction house in Belton, Mo. Normally, they sell late-model cars for manufacturers and rental companies to dealers. That’s where a lot of the cars that you see on the used lot of the local new car dealer come from. But a couple of times a year they have a Corvette and Specialty Car Sale. It is still only open to dealers, but in this case they have an interesting mix of classic and special interest cars. It is hard to find information for, because they don’t publish it on their website. But my dad works out there, however, which is why I can share some of it with you. The Midwest All-Truck Nationals took place on Saturday and Sunday at the E.H. Young Riverfront Park in Riverside, Mo., but the festivities actually started Friday night with a kickoff cruise for both cars and trucks. This was a nice little gathering, with live music, a laid-back atmosphere, and a handful of interesting cars and trucks. Sure, it was a little warm. But that never stops the car kooks from getting together. Now’s the time to enjoy all the great car events that are coming up over the weekend, because winter will be here before you know it. There are several really large events, including the KCI Cruise at the Ambassador Building, the Turkey Creek show in Merriam, and the return of the Gladfest show. Good cruises include the Basehor Sonic on Friday the 13th, Hartman Heritage in Independence on Saturday, and Margarita’s in Shawnee on Sunday. Take a look at the entire schedule of Kansas City car shows, car cruises, and car races in the calendar below. Parkville held their monthly cruise last Saturday night, so as usual, I stopped by to take some pictures. The attendance was a bit down from the crushing mass of cars that was there last month, but the temperature was hovering at around 100-degrees. Considering the miserable conditions, and the fact that the Main Street Parkville Association hasn’t figured out how to air-condition English Landing Park, I’d say they did all right. As the owner of an old truck, I always look forward to the Midwest All-Truck Nationals, which made its annual stop at the E.H. Young Riverfront Park in Riverside, Mo., over the weekend. This event is hosted by the Genuine Chevy/GMC Truck Club of Kansas City. How seriously do I take this show? Well, I usually take my truck to a real car wash and blast it with a high-pressure wand instead of just hosing it off in the driveway, and I climb into the bed and sweep it out with a broom. So yeah, it’s a pretty big deal. Chevy trucks. You gotta’ love ‘em. There’s hardly a major structure built in the last 95 years for which there wasn’t some kind of Chevrolet truck involved. From the farm to the city, and everything in between, you are going to find a cab, a box, and a bowtie. But the main function of trucks rarely changes, so you don’t see all-new models very often. That’s why when they do, you know it’s for a good reason. Enter the all-new 2014 Chevy Silverado. With stiff competition from the Ford F-150 and the Ram 1500, Chevrolet really needed to hit a home run with this one. There was plenty of excitement on the streets of Kansas City this week when we were given the key to one of the first 1961 Corvettes in town. No, this isn’t a complete overhaul of America’s only true sports car, but people certainly noticed the changes. Never have we had a car that drew such a crowd everywhere it went. The Corvette continues to be an object of desire for many, and after our time behind the wheel, we can easily see why. If you like trucks, this is a big weekend for you. The Midwest All-Truck Nationals invades Riverside all weekend, and you’ll be able to see trucks of every shape and size. The HMC truck is even signed up! Of course, if you don’t like trucks, there are plenty of things for you too. There are cruises in Parkville, Overland Park, and Independence throughout the weekend. And of course, don’t forget the full calendar of car races that are taking place right in our area. If you haven’t been to the races in awhile, you’ll be glad you went. See the entire Kansas City car show, car cruise, and car racing schedule below. And don’t forget the sunscreen! The Greaserama is one of the most interesting car shows of the year. Now, you aren’t going to see too many high-dollar show cars (although there are a few). Some of the things there are downright scary. But that’s actually what many of these owners are going for. This event oozes personality. Look for rust. Look for tattoos. But most of all, look for fun; because that’s the point of this show. This year, the event was moved from the old Boulevard Drive-In location to the Platte County Fairgrounds. Some people were concerned with that. But they didn’t need to be. I think this was the best Greaserama the Los Punk Rods Car Club has ever hosted.